Seems like, yet again, the Inbox tea hits a home run with a redesigned mobile search functionality. I went to search for an email from my Nexus 6P and noticed a completely redesigned search interface. It appears that the new mobile search is broken into three sections of common items you may have received or searched for. These sections, which are scrollable to the left and right, include Contacts, Businesses or Refinements. 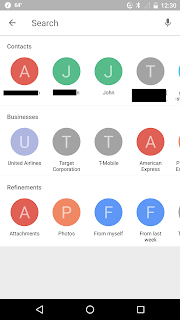 Clicking on on of the contacts or businesses brings up a search results that included emails and cards that may have those contacts or businesses. Refinements appear to be pre-determined system generated searches. The include emails with Attachements, Photos, From Myself, From Last Week, Things To Do (pending reminders), Calendar Events, Unread Emails, Pinned Messages, and older than 1 year. These are some awesome predetermined that will make managing and finding items in Inbox by Gmail so much faster and efficient. If this comes to the desktop, the Things To Do search, basically puts my new extension (Pending Reminders) out of commission. I am not sure if this has rolled out to everyone yet, or even if it is coming to iOS or desktop, but I can confirm its on Android. This was enabled for me for a few days and has since disappeared. Anyone else with a similar experience?